Corporate Wellness is being embraced by many businesses around the globe. The Corporate Wellness training and sessions are conducted on-site and at times that do not conflict with employees’ daily work schedules. The classes are held in a quiet conference room with participants sitting in chairs. Participants may wear traditional or casual business attire. Corporate Meditation Classes are taught in SF Bay Area. As most corporations do not know what to expect from a Meditation program, we offer an Intro to Meditation class. These are one hour classes taught at your office where employees have an opportunity to learn how to meditate, experience a Guided Meditation, ask questions, and learn how Meditation can be effectively used in the corporate environment. If you would like to experience one of our classes, you can book one of our corporate Meditation classes. Our “packaged” Corporate Meditation classes are intended for groups of up to 40 people where the business is located in San Francisco Bay Area. If you have specific needs, have a specific subject/topic you want covered in the Meditation, want the class on a specific day please let us know. 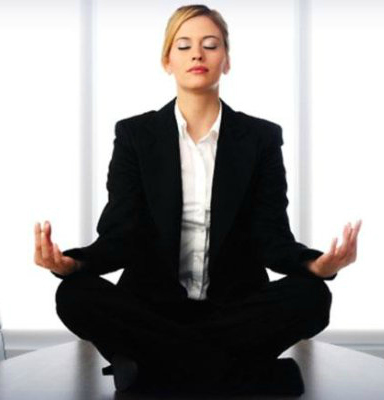 Although there are different styles of Meditation, the most common style taught in corporations is “Mindfulness”. We include Mindfulness in our teachings, however, we are unique in our corporate teachings. We work on setting “goals” and teach employees how to see and achieve these goals through Meditation. These goals may include how to become more confidant, how to prepare for big meetings, how to remove anxiety and stress, how to relate better to fellow employees, how to wind down at night and get restful sleep, and so much more. The classes are completely non-religious.